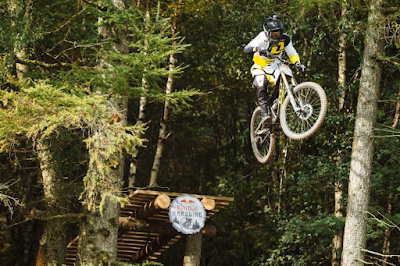 Tickets now available for one of the World's toughest downhill mountain bike races. Red Bull Hardline with Jeep, returns to the hills of Mid-Wales this summer and this time it's not shrouded in secrecy - you can now grab your chance to be there! 20 of the World's finest downhill mountain bikers will once again be invited to ride Dan Atherton's construction that promises to be bigger, more technical and all i all gnarlier than the 2014 edition. Last year's racetrack was one of the most demanding ever seen, pushing the World's best to their limits. Huge rock gardens, giant slab rolls, tight wood sections, technical natural features and the now infamous road gap created a track to push downhill racing up a level and this year promises to raise the bar once again. Speaking of the return of Red Bull Hardline, Dan Atherton said: "The plan has always been to bring the race back bigger than before and make it more of an event for fans to be part of, this year's edition looks set to do this." Tickets can now be purchased from redbull.com/hardline for the event, which will take place over the weekend of the 12th and 13th September.